100% wholegrains. Helps lower cholesterol. Source of fibre. No added sugar. Helps lower Cholesterol? ?Oat beta-glucan has been shown to lower blood cholesterol. High cholesterol is a risk factor in the development of coronary heart disease. 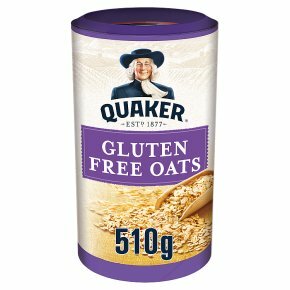 Cooking InstructionsMix 40 g of Quaker Oats with 240 ml of milk (or cold water) in a saucepan and bring to the boil. Simmer for 4 minutes. Microwave InstructionsMix 40 g of Quaker Oats with 240 ml of milk (or cold water) in a microwaveable bowl and stir. Place the bowl in the microwave for 2 mins on full power (Cat E min 800w). Let stand for 1 minute and stir. Microwave for a further 2 mins. When ready, stir & enjoy!